Moorcroft ‘Florian Ware’ Violets Vase, 1898-1905, slender waisted body with wavy rim, delicately tube-lined with tall multi-colored violets on a deep blue and pale blue ground, transfer printed mark shield mark in green, script mark W, Moorcroft, Des, in green and M1887, 12” (30.8cm). Excellent condition. For a very similar vase see – Moorcroft, revised edition 1897-1993, Paul Atterbury, pg. 37. Fig 4. 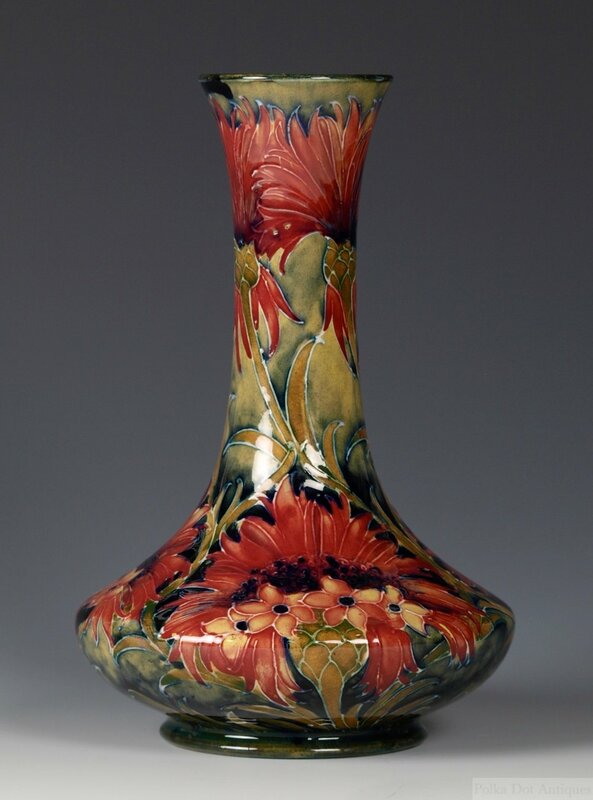 Moorcroft ‘Brown Chrysanthemum’ Vase, 1916-1918, compressed ovoid body tapering to tall a narrow neck, tube-lined large flower heads and leaves, impressed, Moorcroft, Burslem, England, 62, script signature in green, 8" (20.5cm). Excellent condition. Miniature Moorcroft ‘Moonlit Blue’ Vase, 1918-1929, swelling shouldered body tapering to the base, tube-lined with a band of tall trees in a landscape, with pale green speckling on the trees, impressed, Moorcroft, Made in England, 146, 3¼“ (8.3cm). Excellent condition. Miniature Moorcroft ‘Pomegranate’ Vase, 1914-1916, swelling ovoid body tapering to a narrow neck, tube-lined with fruits amongst berries and leaves, on a green ground, impressed, Moorcroft, Burslem, 2A, 3½“ (9.cm). Excellent condition. Moorcroft ‘Florian Ware’ Lilac Vase, 1898-1905, swelling cylindrical vase tapering to the short slightly waisted neck, finely tube-lined with bunches of lilac flowers and foliage in tones of blue with red spotting, transfer printed mark shield mark in green, script mark W, Moorcroft, Des, in green, 6½” (16.2cm). Excellent condition. Two Moorcroft Acorn Salts, 1920-1930s, each molded of acron form, one in an orange luster glaze the other in white with a gilt beaded band, impressed, Moorcroft, and the white, Moorcroft, Burslem, 2½" high. (2). ). Excellent condition.